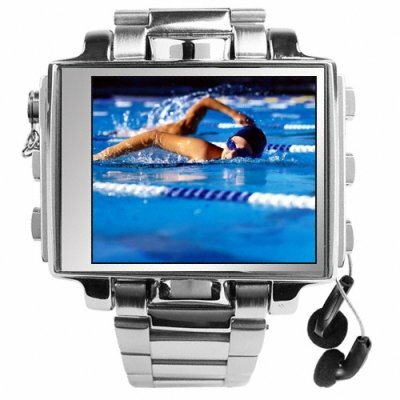 Successfully Added Ultimate Style 2GB Steel MP4 Player Watch - 1.8 Inch Screen to your Shopping Cart. Steel MP3 + MP4 Player Watch. In our effort to always bring you the latest and greatest new electronic gadgets, we now brings you this 2GB MP4 Watch with Full Color 1.8 Inch Screen and made completely from steel for the ultimate in style and coolness. To compare with the other range of watches. This has a similar firmware to the plastic Widescreen MP4 player chinavasion sells but it doesn't have the FM tuner and Speaker. The watch is TOP QUALITY, Steel with Glass face. It's a VERY heavy watch. The band needs adjusting to your wrist size and I would suggest people with small wrists not think about this watch due to it's size. The screen size is not 1.8inch it is 1.5 inch, even the box it comes in says so. The packaging is pretty plain unlike the other watches. I would personally prefer the metal case like the other widescreen for this. The watch has nice Animated Menu's. Picture quality is superb for TFT, better than the other widescreen. MTV files from the previous watch do not work and you get an updated MTV converter program that works great. I give it 5 stars due to it's Quality and features.